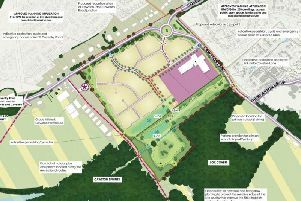 Rugby planning committee’s decision to reject plans to build a pig farm near Grandborough is being appealed by applicant John Evans. The appeal will be processed by the government’s planning inspectorate, with no date of decision in place yet. Residents previously set up a petition and a group, People in Grandborough say No Pigs, to oppose the plans, which would see the building of two barns to house up to 1,250 pigs each, a slurry store and feed bins on land off Broadwell Road. Rugby’s planning committee rejected the application this year on February 21. The appeal can be found on acp.planninginspectorate.gov.uk using reference 3198388.